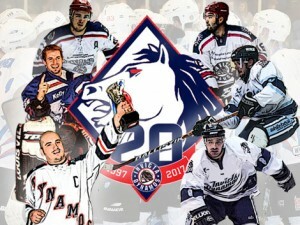 The Invicta Dynamos are delighted to announce six additions to the legends team set to face the Dynamos in Gillingham on Sunday 23rd April with goalie Matt Van Der Velden, D-men Peter Korff, Adam Copland and Ryan Giles and forwards Anthony Leone and Stuart Low all joining the roster. 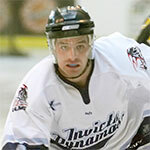 Forward Stuart Low spent four and a half seasons with the Invicta Dynamos first appearing for the team for the second part of 2002/03 before returning for four full campaigns from 2004/05. During that time the skater was part of 5 league winning sides, won a national title, two playoff titles and even added a cup win to boot. Later on he would move on back to Romford from whence he had come but not before having played 171 games for the Dynamos and racking up an impressive 183 points in the process – 80 of those goals as he found twine himself and 103 as he set up his teammates. Low’s tally means that even today he is still in the top 20 of the club’s list of all time points’ scorers and earns him a place on the legends roster in the number 8 jersey that he made his own. Known for his shimmering locks, defenceman Peter Korff resisted the urge to carve out a career in L’Oreal adverts instead plying his trade on the blue line for the Invicta Dynamos over an impressive eight consecutive seasons. 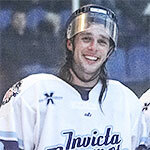 Korff first iced for the Mos in 2000 when the club were competing in the EPL and he remained when they dropped down to what is now the NIHL in 2003. He’d appear in Gillingham until 2008 ahead of a move out west to the Bristol Pitbulls but departed having racked up a remarkable 335 appearances in Kent – the most of any defenceman to wear a Dynamos jersey and fourth highest tally of any player in the club’s history. In those 335 games Korff found the net 41 times, assisted a further 108 goals and so amassed an overall total of 149 points – not bad for a blue liner. 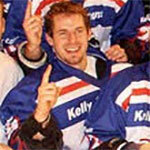 The number 10 was a popular figure at the SilverBlades Gillingham and undoubtedly worthy of his spot on the legends team roster. A product of the Dynamos youth setup, Adam Copland rose through the ranks and went on to have three stints with the team between outings for Basingstoke, Romford and Chelmsford. He first dressed for the Mos in the 2003/04 season, returned again in 2008/09 and three times was a charm when he signed on the dotted line once more in 2010/11 – this time staying put for three campaigns. 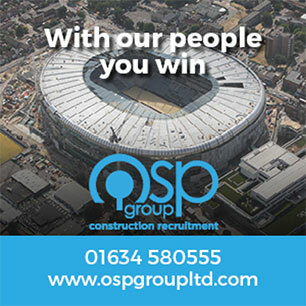 The ‘stay at home’ defenceman brought EPL experience to the line-up and won two league titles, a national title, a playoffs title and even a cup to add to the rest during his 5 seasons in Gillingham racking up a total of 201 appearances in the process. 25 goals and 92 assists also saw the blue liner chip in with 117 points before making his last outing for the club ahead of the summer of 2013. Still going strong today, Anthony Leone spent seven seasons in Gillingham across two spells and first pulled on a Mos jersey having arrived from the then EPL Chelmsford Chieftains in the summer of 2006. It would become a regular occurrence as the feisty forward iced in Kent for four terms before returning again in 2012 for another three. The forward quickly forged a reputation as one of the hardest hitters in the league but he also found a knack for grabbing important goals with 132 coming during 302 appearances for the Dynamos. 128 assists meant that when Leone left Kent for Essex in 2015, he did so having amassed 260 points. 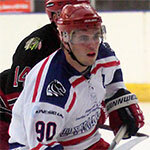 In his lengthy career the skater has also iced for Romford and Chelmsford and his leadership qualities have always stood out – Leone wearing the ‘C’ at each of the three clubs he has played for. Goalie Matt Van Der Velden predominantly iced in the EPL during a career that took him to Cardiff, Oxford, Romford, Milton Keynes, Chelmsford and of course our very own Invicta Dynamos. In Gillingham he made 124 appearances – the second most of any netminder to wear a Mos jersey in Kent – and was a part of the club from 1999/00 to 2002/03. In that time he stood between the pipes, and often on his head, to help the Dynamos secure what remains their highest ranked honours to date – the EPL league and playoff titles back in 2001/02 before the club were later forced to drop down a league due to financial constraints. His input that year alone would be enough to secure Van Der Velden a place on the legends team and he must undoubtedly go down as one of the best netminders to pull on the jersey in the club’s history. He might be known more recently for wearing the colours of the enemy but before his stints in Chelmsford and Streatham the blue liner spent the majority of his hockey career in Kent with the Dynamos. Having played some junior hockey in Gillingham, Giles first appeared for the seniors as a promising youngster in 2006 and played a part in every Mos season that followed until departing for Romford in the summer of 2012. 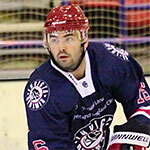 He would return for another year in 2013/14 before Essex and London then came calling – Giles finishing this season under the watch of Jeremy Cornish in Streatham. A ‘stay at home’ defenceman, Giles is a physical opponent who enjoys making the hit and who is equally happy to ditch the gloves in aid of his teammates. In 229 appearances at the SIlverBlades he managed 22 goals and 92 assists for 114 points not to mention four league titles and one national championship along the way. Further players on the Legends team roster will be announced soon.